a. God Save The Queen is the official national anthem, but is generally used only on regal and vice-regal occasions. Antigua and Barbuda is an island nation in the eastern Caribbean Sea on the boundary with the Atlantic Ocean. 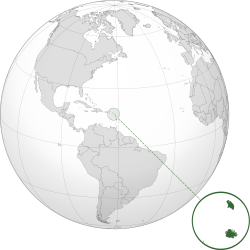 Antigua and Barbuda are part of the Lesser Antilles archipelago. In 2011, about 81,800 people lived there. The capital and largest port and city is St. John's, on Antigua. The country used to be a part of the British Empire. The nation still belongs to the British Commonwealth. Note: Though Barbuda and Redonda are called dependencies, they are important parts of the state. Dependency is simply a title. Below is a list of the ten largest cities. For other cities see List of cities in Antigua and Barbuda. Below is a list of the islands of the country. Tourism is the main part of the economy. It is more than half of the Gross Domestic Product (GDP). Antigua is famous for its many luxury resorts. Investment banking and financial services are also important. The Royal Antigua and Barbuda Defence Force has 285 members. English is the official language, but many of the locals speak Antiguan Creole. The Barbudan accent is slightly different from the Antiguan. ↑ 1.0 1.1 1.2 1.3 "Antigua and Barbuda". International Monetary Fund. http://www.imf.org/external/pubs/ft/weo/2013/01/weodata/weorept.aspx?sy=2009&ey=2012&scsm=1&ssd=1&sort=country&ds=.&br=1&c=311&s=NGDPD%2CNGDPDPC%2CPPPGDP%2CPPPPC%2CLP&grp=0&a=&pr.x=33&pr.y=11. Retrieved 2013-04-18. This page was last changed on 23 August 2014, at 23:46.